Travel to the southeast to green Vietnam, popular for its light food with robust flavours. Hold on, hold on now! You don’t have to open up your jam-packed iCalendar just yet and fret over your lack of free time. We’re not talking about taking a three and a half hour tiring flight, when the roads of Delhi will take you directly to the lakes of Hanoi or the narrow alleys of Ho Chi Minh City. Restaurants in the city are now serving exquisite Vietnamese dishes that will keep you wanting more. Great food that won’t burn a hole in your pocket is what you’ll find here. If you’re seeking comfort in food, head straight to Asia Central without batting an eyelid. Big city, fast-paced life means you can’t always afford a holiday, but you sure as hell deserve good, authentic food. DSSC Recommends: Vietnamese Rice Paper Rolls – not many places can serve a good rice paper roll for it’s a tricky dish to whip up. Nothing is fried or cooked, it’s all about the real flavours of produce. Our kudos to Asia Central for being brave enough to serve these bad boys up, and serving them right. A DSSC favourite. Chef Ritu Dalmia is one of the few chefs in Delhi that has played a huge part in revamping its food scene and bringing authentic flavours to your dining table. She really understands the pleasure food can induce, so we think you should hop over to her restaurant and try the Asian Tapas, an awesome style of serving food that lets you try many different dishes in small bites. DSSC Recommends: Rice Paper Rolls filled with Enoki – these healthy bites of sheer deliciousness are our favourite dish on the menu. We bet they’ll be yours too! It’s ironic that this place is called Honk, because what it offers is the complete opposite. With peaceful and serene interiors and delicate food, a meal here will make you feel like you’ve just stepped out of a spa retreat. We also suggest this place for its location – it’s tucked away close to the airport and away from the hustle-bustle of city life. DSSC Recommends: Ma Po Tofu – we realise that tofu is an acquired taste, but this dish has a black bean and spicy sauce that will even switch tofu haters to lovers! 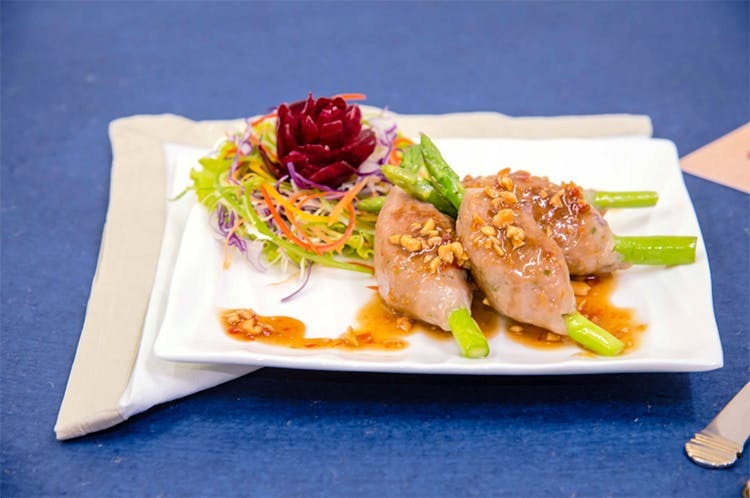 We recommend this place because it’s one of the few authentic Asian restaurants in Dwarka serving different dishes that you don’t often find on the menu of a Vietnamese restaurant. Parts of their interiors are pagoda-inspired, which will give a slightly spiritual touch to your dining experience. DSSC Recommends: Braised Water Chestnuts, Pak Choi and Bamboo Shoots – now where else have you seen these beauties? Find out more about DSSC here and follow them on Facebook here.